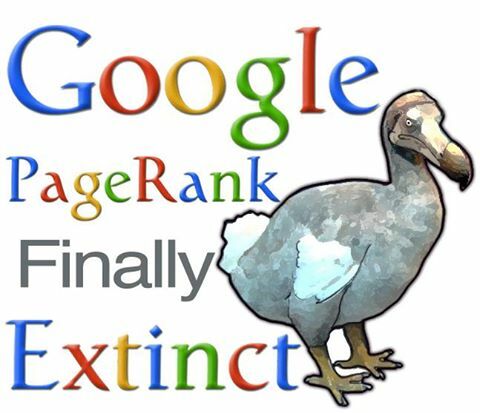 Google PageRank is extinct, what was it and what's replaced it? In March 2016 - Google officially declared PageRank to be extinct. Domain Authority and Trust Flow are the new measures of a website's quality. Google are still likely to use a similar measure to PageRank in-house, they're just not updating the little green bar. Google used to updates the visible PageRank it shows people once every 2-3 months or so. Since 5 February 2013 there hasn't been a single PageRank update and in March 2016 Google announced that PageRank won't be updated again. How do search engines measure a website? All major search engines value incoming links to a site and use this as one of their key determinants as to how highly a site appears in their search results. Google's version of this is called 'PageRank'. The main use of the Google PageRank is to determine how valuable a link would be from another web page. How well your site is optimized for search engines and if the links from other sites contain relevant keywords are also big factors that Google takes into account, though this won't effect the PageRank of a page. Google looks at whether links are from forums or directories, if they're relevant, how many times different keywords appear on a page and many other different factors. Obviously what your keyword is will depend on how competitive it is and therefore how many high quality incoming links you'd need to appear first. Keywords like 'car' or 'holiday' will be more competitive than keywords like 'scarf' or 'tortoise'. The PageRank is only a measure of link popularity, it does NOT measure individual keywords or the overall appearance of a site. It also doesn't measure the overall quality of a site (though a high PageRank implies a high quality site, as it tells you that many other websites link to a site, which is why Google uses it). The more outgoing links you have from a website, the lower the PageRank will be, therefore incoming links increase Google PageRank, whereas outgoing links reduce Google PageRank. Provided your outgoing links are relevant, this reduction in Google PageRank won't however reduce your position in the search results. To find out what the Page Rank of any website (or more specifically, web page) is, please type in the domain name below and press Check. You'll need to include the www if the site uses this. To give you an idea of how competitive the higher PageRanks are, Google.co.uk is PR7, Wikipedia.org and Drupal.org are PR9 and only a handful of sites are PR10 (including Google.com). Broadly speaking, the higher your PageRank, the higher you will appear in the search results and the higher the PageRank of a link going to your website, the more 'boost' it will give you. If your site has a Page Rank of 2 or higher, that is normally sufficient for it to appear well for a range of specific, yet relevant search results - provided that is has good Search Engine Optimization and is not in a highly competitive category (such as website design itself). If it is, a Page Rank of 3, 4 or more may be required. Similarly if your site covers very different subjects or a large geographical area, it may be necessary to have more links going to your site in order for it to appear well for the range of subjects. Every page on your site can have a different PageRank. Generally the home page will have a PageRank that is one higher than other internal pages that have lots of links to them (e.g. PR3 home, PR2 internal pages). Pages with fewer links going to them internally will also have a lower PageRank, unless they have lots of links from other websites. Some internal pages on Wikipedia are actually PR10, even though the home is PR9, as people tend to link to specific pages on Wikipedia, rather than the home page.